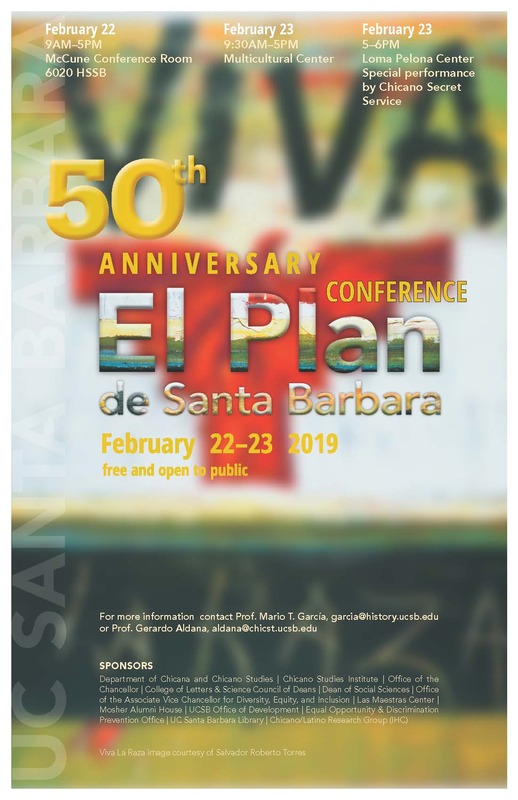 50th Anniversary Conference of El Plan de Santa Barbara! This event is free and open to the publlic. Conference will be held February 22 from 9PM- 5PM in the McCune Conference Room- 6020 HSSB. February 23 from 9:30AM-5PM in the Muliticultural Center and February 23 from 5PM-6PM in the Loma Pelona Center with a soecial performance by Chicano Secret Service. For more information contact Professor Gerardo Aldana at aldana@chicst.ucsb.edu.